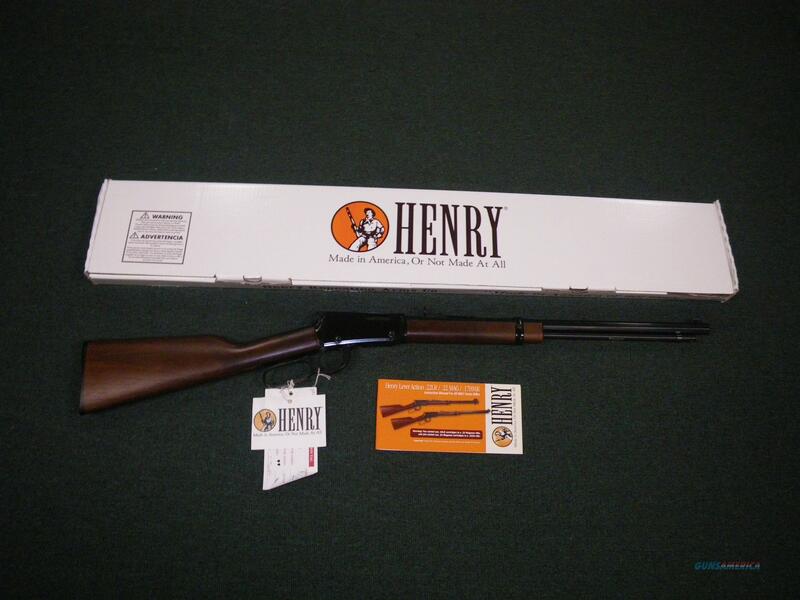 Description: You are bidding on a new Henry lever action octagon rifle in 22 Mag with a 20" octagon barrel. Like stagecoaches, swinging saloon doors and Pony Express riders, there are many innovations of the Old West that have long faded from use and live on only in Western movies and history books. But there are still a few frontier staples that were so effective and ahead of their time that they remain in use today. Take, for instance, the intimidating octagonal barrels commonly found on the repeating rifles of that period. These heavy-duty workhorses sported added mass and extra weight to aid in heat absorption, making them the forerunners to the bull barrels used on modern target and varmint rifles. So as a tip of our Stetson in honor of this timeless barrel style, we replaced the standard round barrel normally used on our world-famous .22 LR and .22 Magnum rifles with a classic 20" octagonal model, like those favored by the cowpunchers, lawmen, homesteaders and outlaws who blazed the trail westward across America. We rounded out this traditional look with an easy-to-adjust Marbles semi-buckhorn rear sight with a diamond insert and a highly visible brass beaded front sight seated in standard 3/8" dovetail slots. A metal barrel band secures both the barrel and the high-capacity tubular magazine to the highgrade American walnut stock. If you prefer a more modern look, the receiver is grooved so you can top off any rifle in this line with your choice of scopes. Both the stock and forearm are crafted of the same richly grained hand-finished American walnut typically found on rifles costing up to three times as much. Displayed images are stock photos. Any questions please feel free to ask (our phone number is in the additional information tab above).